Read about the cutting edge developments in the telecom site management space. 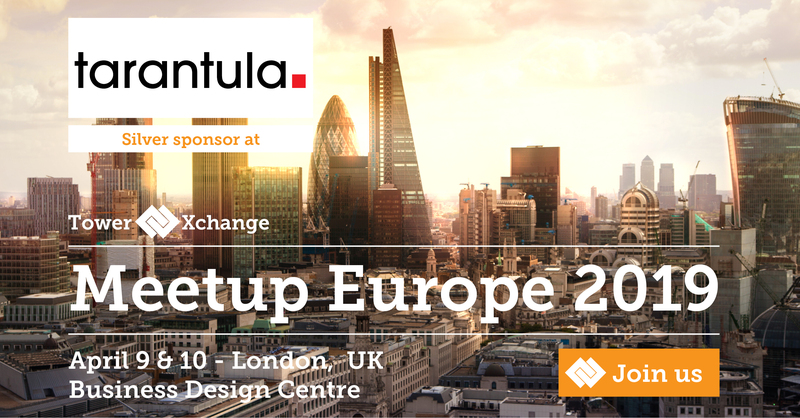 Tarantula is proud to participate in the TowerXchange Europe Meetup 2019 as a silver sponsor. The meetup is scheduled to be held on 9 – 10th April 2019 at the Business Design Centre, London, and we will be at booth 405. Come and chat with us to learn how we can help you make your tower sites more productive and profitable through purpose-built and centralized site management tools. The Tarantula team will be hosting panel and round table discussions to talk about various topics including the tower industry’s needs of project, asset, and contract management, the ongoing development towards 5G, and how tower companies need to adapt as digital infrastructure starts to evolve to support 5G. The team will also be available to set up interactive sessions to showcase our product features and modules designed for keeping track of your site, activities, and financial data in a single repository. Anders Smedberg, CEO, Tarantula said, “We are excited to be back at the Europe Meetup, especially with the growing demand for 5G infrastructure driving a change throughout the industry. We are keen to make new connections and have productive conversations with our existing customers. Our product is both an OSS and BSS tool that drives collaboration and productivity. We look forward to show you the product features that will help to scale your business rapidly with our Quick Launch approach”. To learn more about Tarantula products, please visit booth 405 at the meetup or schedule a meeting with the team at contact@tarantula.net.